I dropped into one of my favorite Ubud restaurants the other day, Warung Sopa (Jalan Sugriwa), for a plate of mixed fresh veggie salads. While the female employee dished out portions, and the sun baked the pavement outside, I asked for Wayan (pronounced why-UN), but he hadn’t arrived yet. As I knelt on a pile of cushions to wait for my meal, I checked my hand phone to see if I had his number. I skimmed through my contacts and suddenly noticed a curious phenomenon: I had no less than a dozen Wayans on my contact list (and remembered that I’d probably deleted half as many in a recent ‘cleansing’); and because of the commonality of that name in Bali, each time I added a new Wayan, of necessity I had to conjure up a mnemonic or nickname to help me recall the individual associated with each Wayan. I typed in “Wayan Ojek” for one of my motorbike drivers; and I wrote Wayan JoniBro for Joni’s older brother – and a driver too. Wayan Toro is an English-speaking Balinese sushi restaurateur. Wayan Mich assists Michele in whipping up amazing tropical fruit jams – yum! Wayan Jaclins is Jaclins’ assistant – a lovely woman whom I’ve met a couple of times but I’m not likely to call again. But wait, I know SO many others: Wayan Fam is an employee that works at a guesthouse I once lived at. She replaced a previous Wayan who was fired because a rumor circulated that she had brought her ancestors’ black magic into the family compound. Another Wayan – proprietor of the eponymous Café in central Ubud – is a well-known entity in this town, with a few prime hotels and resorts under her ownership. I’ve met at least a dozen taxi drivers with the name Wayan; ditto with waiters and waitresses, friends’ household staff, women at the market, friends of my Balinese friends, wives and husbands of my friends. Neighbors. Teachers. Massage therapists. Spa owners. You name it. There’s a Wayan just around the corner. One couple I know employ two Wayans in their jewelry business; they simplified matters by calling them Wayan Empat (Wayan #4) and Wayan Lima (Wayan #5; I suppose others preceded them). If you haven’t yet noticed a pattern, Bali is the locus of all Wayans; Wayan Headquarters. Why so many Wayans?! Wayan is derived from the old word “wayahan” which means the oldest. 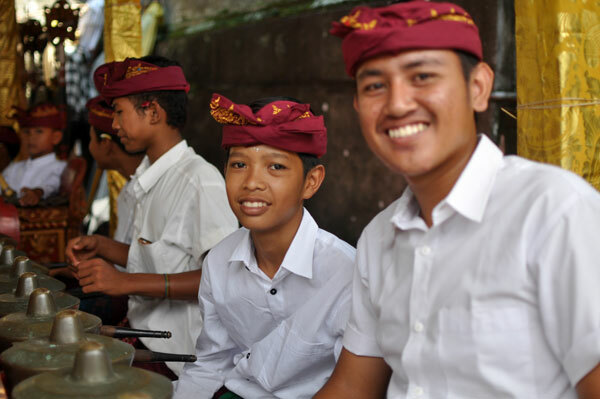 So the first child in every Balinese Hindu family – of the Sudra caste – is traditionally named Wayan. Besides Wayan, first-borns may also be named Putu or Gede. The second child in the family is named Madé or Kadek, the third is called Nyoman or Komang, and the fourth gets Ketut. These names apply equally to boys and girls. If parents have more than four kids, the fifth child will be named Wayan – and the order repeats itself. Imagine entering a classroom and asking students their names; how many hands do you imagine might go up if you asked for Wayan?! Which is why nicknames abound, Yan and Yanni among the most prominent. There’s something rather quirky, almost surreal, about this unique naming phenomenon, often causing me to roll my eyes or laugh when I’m introduced to someone new: Siapa nama anda? (What’s your name, I ask). Wayan. Oh no, not another Wayan. How am I to differentiate this one from all the others?! All this Wayan-ing tempts me, the next time I fly into Bali, to walk straight out the doors into the frenzied crowd (comprised mostly of Balinese taxi drivers), wearing a t-shirt that simply reads: Dimana Wayan? Where’s Wayan?